LEFT: Testing, using the company logo and a clock. 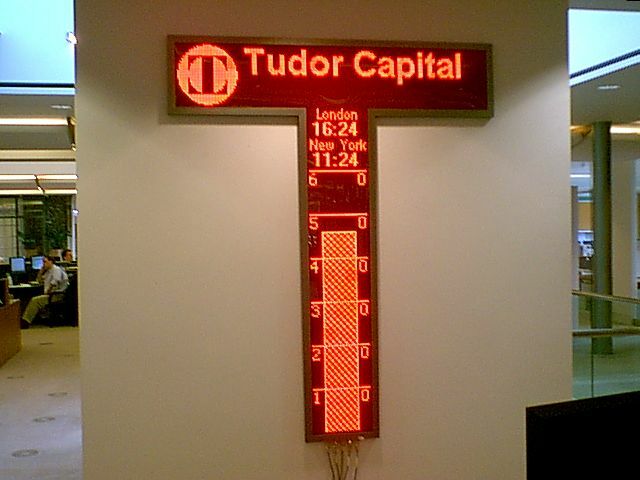 The vertical bar represents seconds and increments one row of LED's every 1/3 of a second. The logo on the far left is animated, spinning one revolution every 10 seconds around its vertical axis. MIDDLE: Initial testing while the unit was still face down. 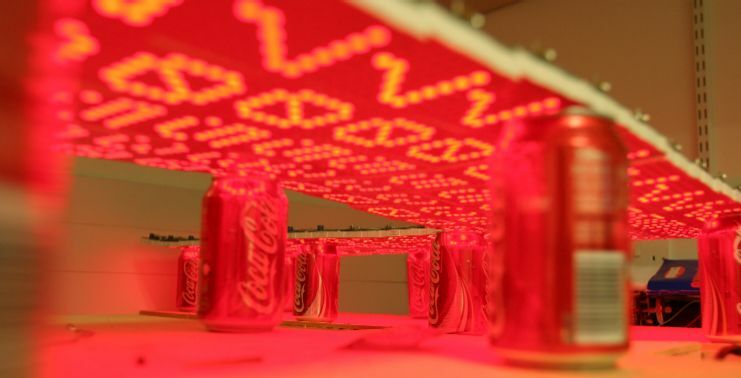 In order to view the LED's I built a special custom mounting stand (raw materials: one crate of 24 coca cola cans). RIGHT: Power supply consisting of four standard 300W PC power supplies. LEFT: This interface connects the displays to the PC parallel (printer) port. There are several IC's on the reverse side of the boards as well. The cross section of this interface is approx 25mm x 25mm and it is designed to slide inside the hollow aluminium frame that makes the cabinet. MIDDLE: Close-up showing one of the 8 modules which have a suface mount LM75 temperature sensor IC glued piggy back. This was used to measure the thermal characteristics of the LED board (I mean stop it from melting). 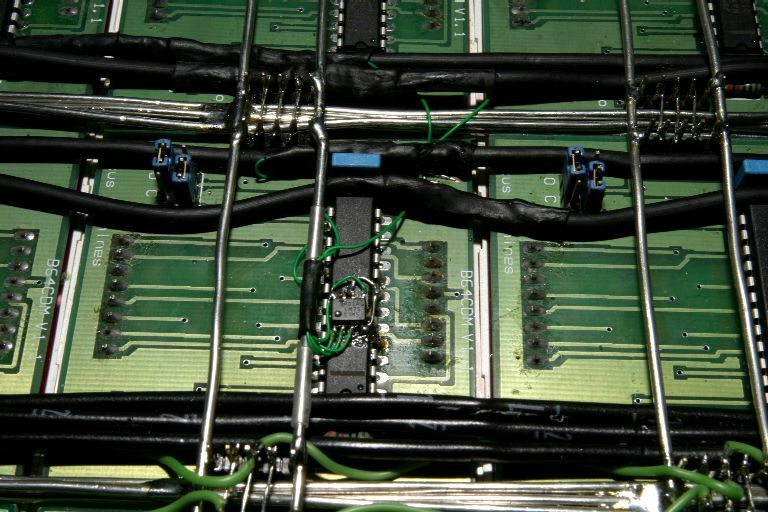 This photo also shows the power connections between modules. The +5V rail (right hand wire of each vertically running pair in the picture) is at a different height to the ground system so there is no shorting. To get enough heat to solder the points where the three vertical ground cables cross the horizontal ones, I had to specially purchase a 100W instant-heat solder gun, which takes a mere 6 seconds from cold to heat up enough to solder the joint. Even so you have to hold it on for many seconds to melt the whole joint. 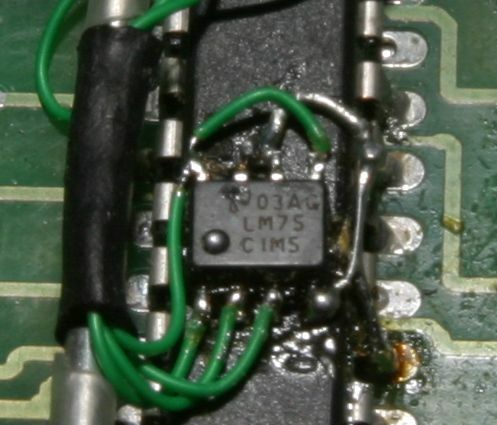 RIGHT: Even closer-up showing the LM75 surface mount IC glued to the top of a MAX7219. Soldering these connections requires a steady hand. 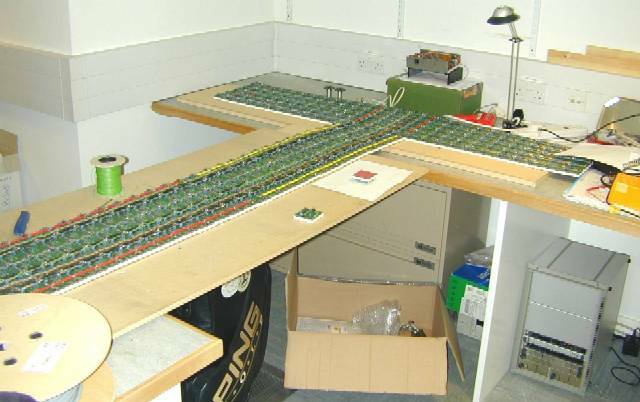 LEFT: General view of the riskometer under construction in a store room in the office basement. The vertical leg of the T lies on a piece of wood spanning the desks on either side of the room, with an appropriately sized golf bag in the middle for extra support. I used to use 2 servers stacked on top of each other but they were needed elsewhere. I don't know why there's a golf bag in the store room. 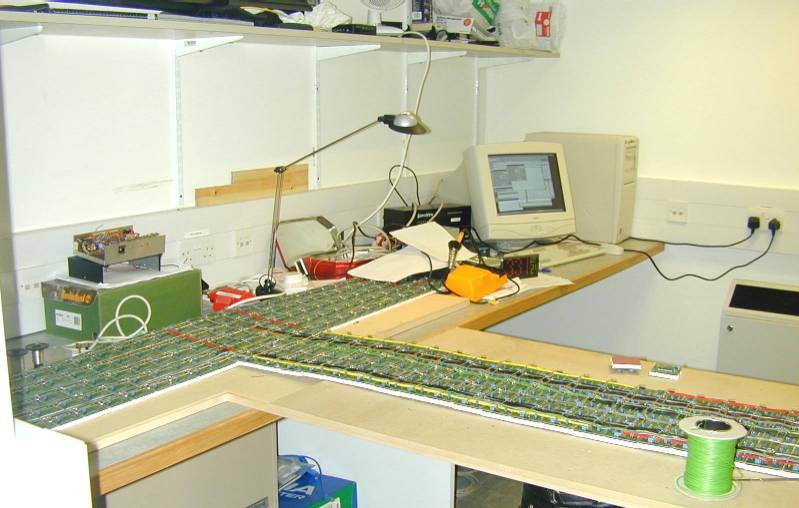 MIDDLE: Another view of the riskometer showing the computer in the background, with the LED matrix clock demonstrator in front (just after I took the photos for that page). RIGHT: Nice view along the vertical leg of the T. Construction uses 1.6mm diameter tinned copper wire for the ground and +5V connections to the modules (ground connections run horizontally and vertically, +5V connections run horizontally). The vertical ground connections up the vertical leg of the T are 12 1.6mm diameter tinned copper wires. 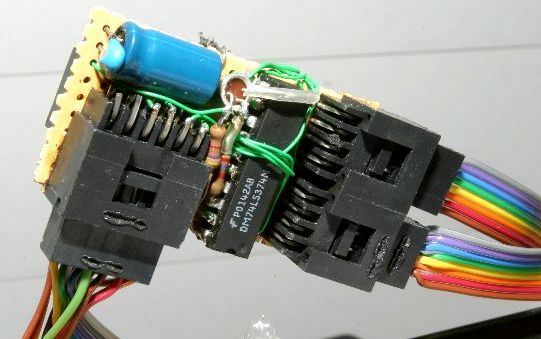 The horizontal power connectors are connected vertically by 4 1.6mm diameter tinned copper wires insulated with heat-resistant sleeving (yellow and red in the picture). 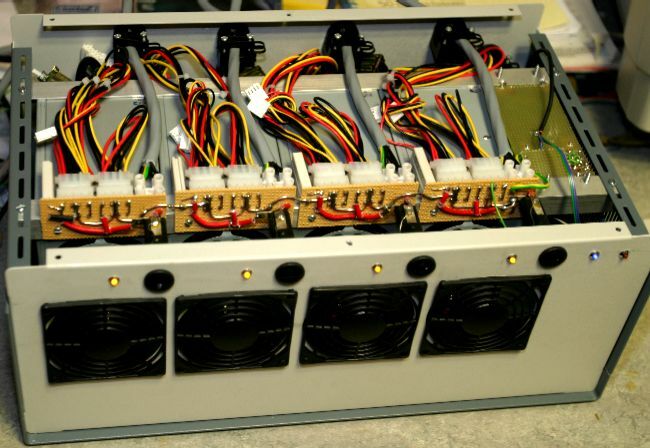 They are connected in 4 banks and will be supplied by 4 300W standard PC power supplies. The power will be socketed to the T from the base, so 4 2mm-squared cross-section multi-core insulated cable is used to connect each bank to the sockets in the base. The idea of all the large amount of cross section of copper wire is to minimise the voltage drop across the cabling (the total peak current consumption of the array will be 100A at +5V). 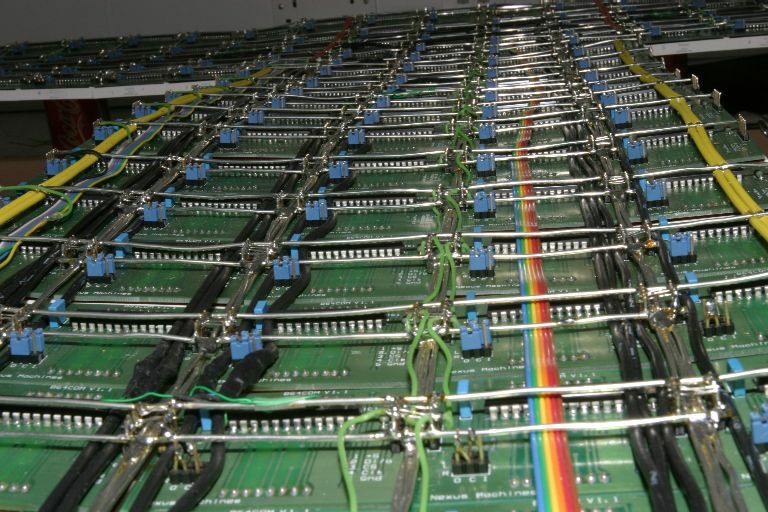 Signal wire and ribbon cable are used for the data connections. In the base of the T is a small circuit board containing 74LS374 latches for buffering the parallel port after the 5m length printer cable, and generating the chip select and clock signals for the LED module array.